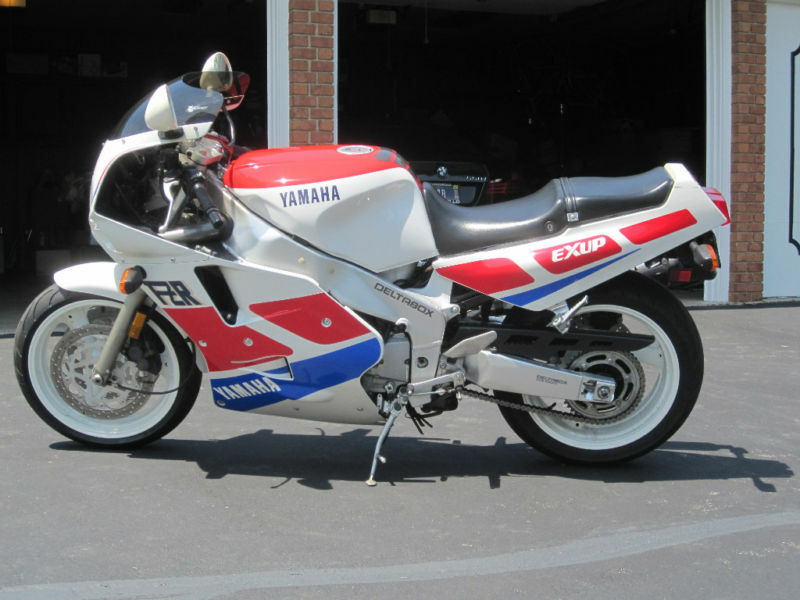 The Yamaha FZR1000 EXUP was named "Bike of the Decade" [the 1980s] by Cycleworld magazine, meaning it faced down some very tough competition, including the Ducati 851, Suzuki RG500, and the original GSX-R750. What made it so special? 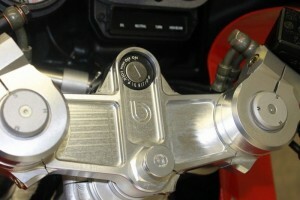 Well servo-actuated exhaust valves are pretty ubiquitous these days, but the big FZR was the first four-stroke to feature one on its five-valve Genesis motor. 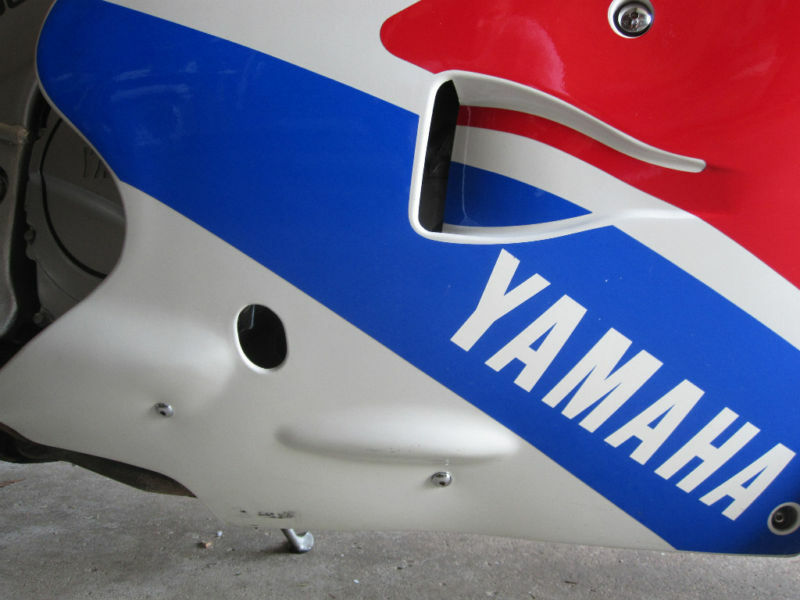 Yamaha's EXUP or "Exhaust Ultimate Power" valve varied exhaust flow to maximize high rpm power and low rpm torque, two characteristics that were often considered mutually-exclusive. Attention Collectors! 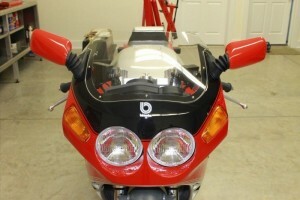 Bike of the Decade... 1992 FZR 1000 EXUP Delta Box Genesis Great Condition / Survivor > Always stored indoors on carpet! extra Rare Corbin seat with back rest, plus original mint solo seat with fairing. Must see pictures. 8738 miles. Just serviced Clear Title / resides in living room / tank drained, carbs cleaned / clean unused oil, and new fluids, serious inquires, Seller reserves the right to end auction early for private or collector sale. Sold as is, wonderful bike. 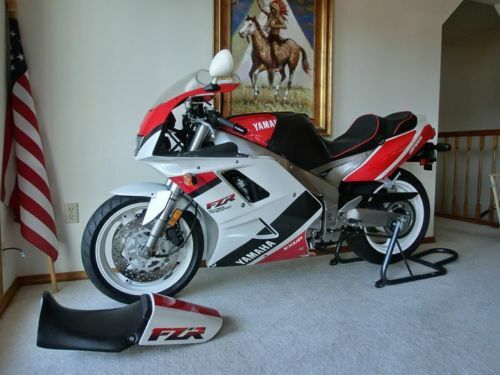 The FZR1000 in red and white is a great looking example of a 90s superbike. It's not especially valuable as yet, but has the potential to appreciate as people snap up the few remaining pristine, low-mileage examples. 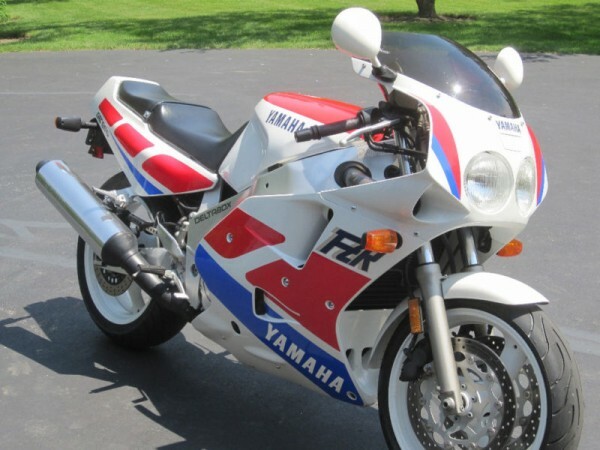 The $7,500 the seller is asking is steep, but this looks like it's in very nice condition, with low miles so, if you're into Yamahas, this might be a great opportunity to add a nearly pristine example of this very functional sportbike to your collection. 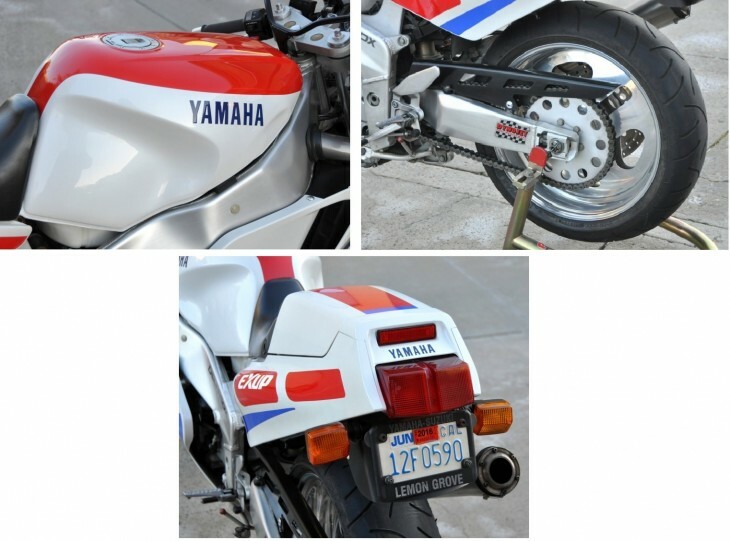 Back at the end of the 1980's Yamaha was achieving success across its entire lineup of sportbikes with the FZR400, FZR750 (also known as the OW01) and at the top, the FZR1000. The FZR1000 was ruling the litre class not due its having the most powerful engine or the best handling but by having the best overall balance. 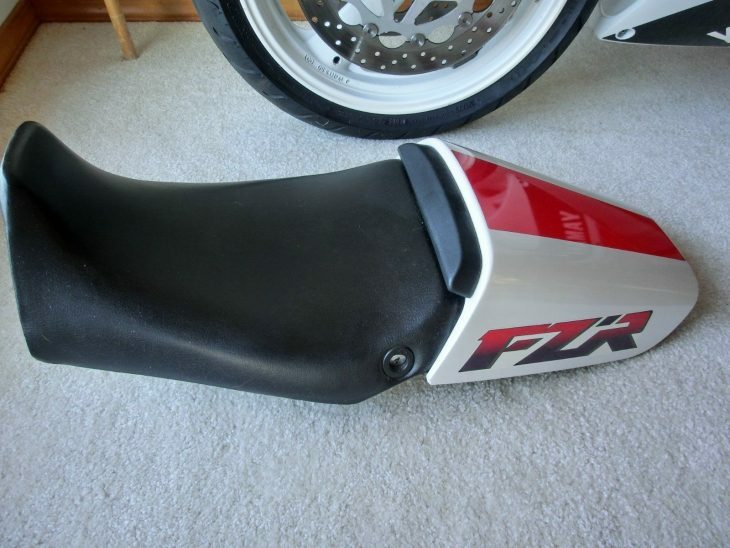 How good was the FZR1000? Let me put it this way; the FZR1000 was crowned "bike of the decade" by Cycle World and has been referenced as the most complete sportbike of its generation. 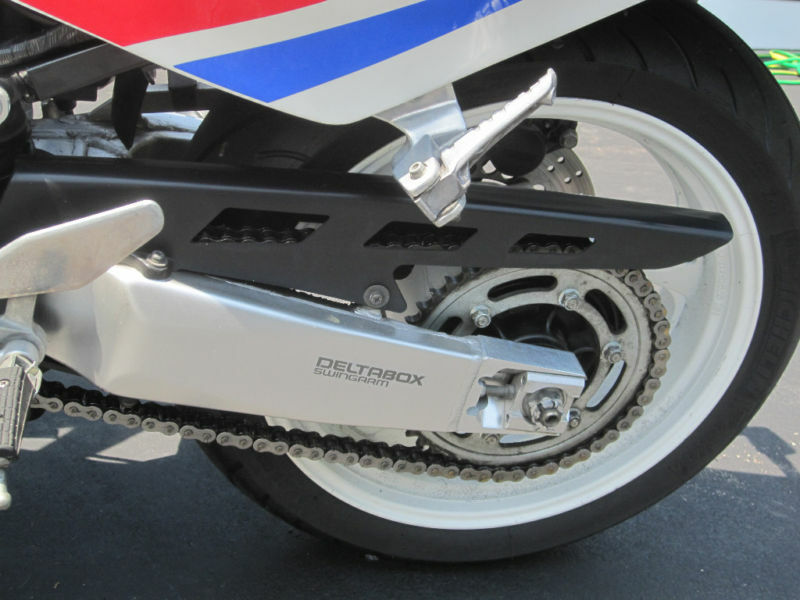 While the FZR did not have the most powerful engine of the late 1980's litre bikes, it did have one significant advantage over its rivals; the EXUP system. 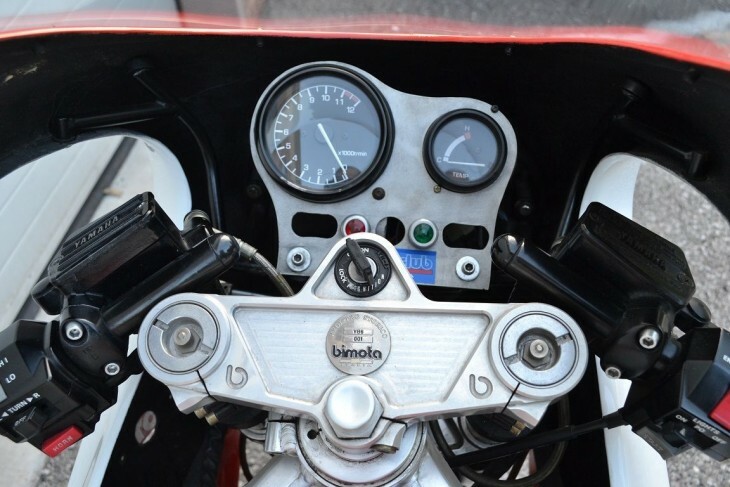 EXUP (Exhaust Ultimate Power value) was a system that adjusted the header opening based on RPM via an ECU-controlled valve. 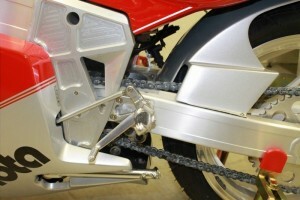 EXUP helped to resolve one of the problems with late 1980's litre bikes; narrow powerbands. The system significantly widened/smoothed out the powerband which made the big Fizzer throttle response immediate no matter what the speed. 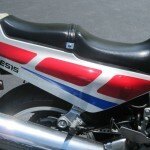 NOTE: Similar setups were eventually launched by the competitors including Suzuki and Honda. An excellent explanation of the EXUP system can be found via this link. 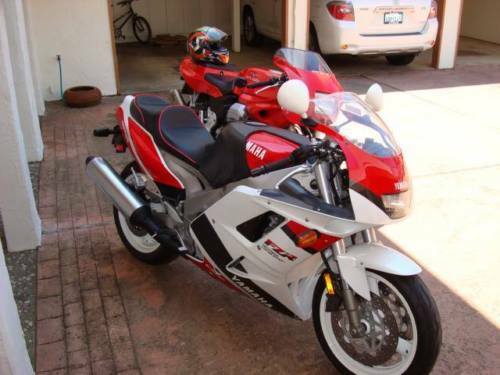 For this listing, the seller has two FZR 1000's available via an estate sale, with both having had the same previous owner. 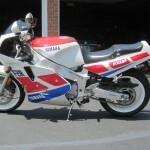 Here is the first one, a 1989 in the OEM white/red/blue that looks to be in excellent condition. Condition for this one looks to be super clean but not completely OEM. Aftermarket items I have noticed include different mirrors, flush mounted front turn signals, a supertrapp exhaust and the rear wheels have been upgraded to Performance Machine units. Overall the bike looks to be immaculate and given the previous owners reputation for bike care, the bike seems to be in outstanding condition. From the estate of aerospace engineer & club road racer David Molitor, known for the meticulous care of his street and racing bikes. 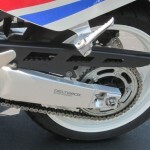 This is Molitor's street FZR1000. Showing less than 14,000 well-kept miles, it has just been treated to a 'make-run' consisting of a carb clean, new sparkplugs & fresh battery. 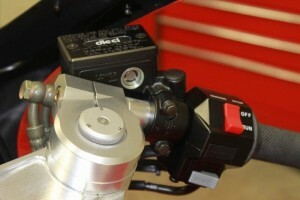 Compression on all cylinders was 210-215 psi and the engine recorded 127.8 hp at the rear wheel on Jordan's dyno-meter. Here is the second one, a 1990 that is setup for the track. Condition for this one isn't as nice as the street version, with some rust apparent on the steel brake rotors and the rear chain. 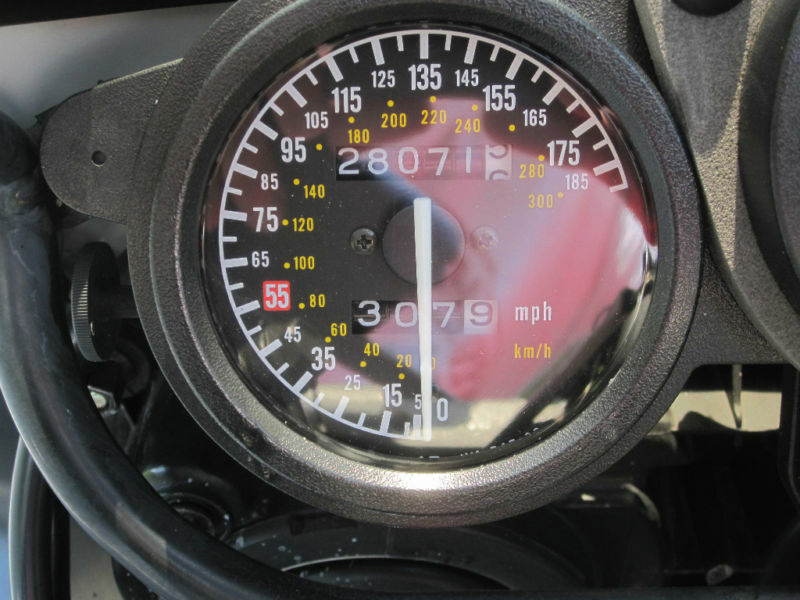 As with all race bikes, condition is a bit a gamble and the pictures have the odometer obscured which is a concern. Also based on the pictures tires will need to be replaced. 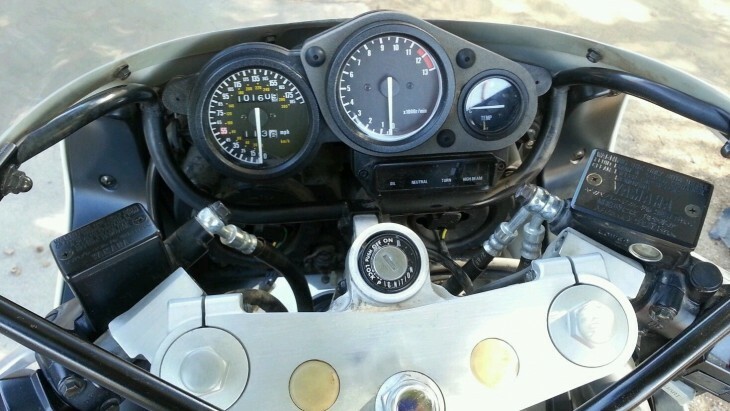 On the plus side, according to the seller the bike has covered less than an estimated 5000 miles and has a host of upgrades. 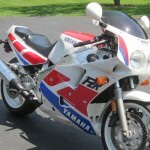 Overall the bike seems to be in good condition for a 26 year old race bike. Now we come to the big question (s): What are these two big Fizzer's worth? Well first of all, the street version will likely cost more than the track version simply by the fact that it hasn't been raced and there will be less worries about the engine condition. 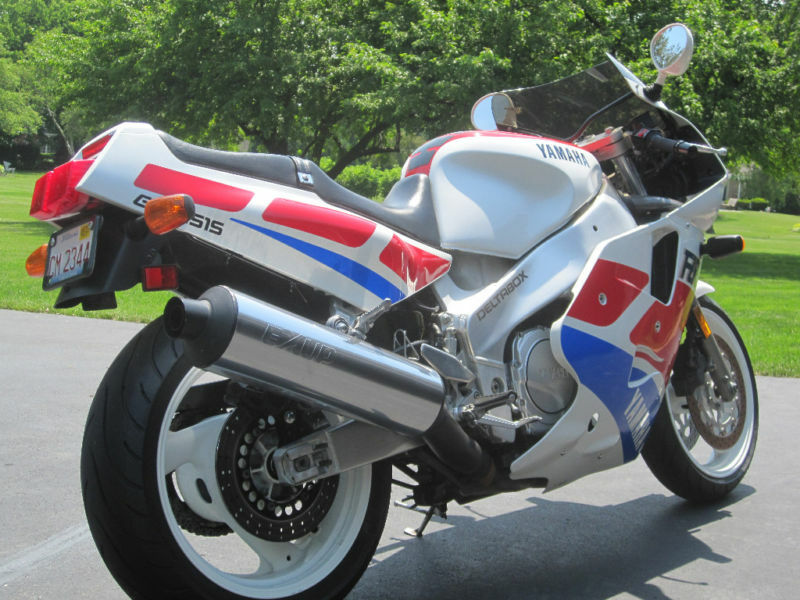 Previous posts on RSBFS of the 1989 FZR1000 seem to show prices climbing in the last few years, with pristine and complete 1st year EXUP versions generating prices of about $6,000 USD. Since this one isn't completely OEM, I would expect the price to be a bit lower, perhaps around $4,500-$5,000 USD? 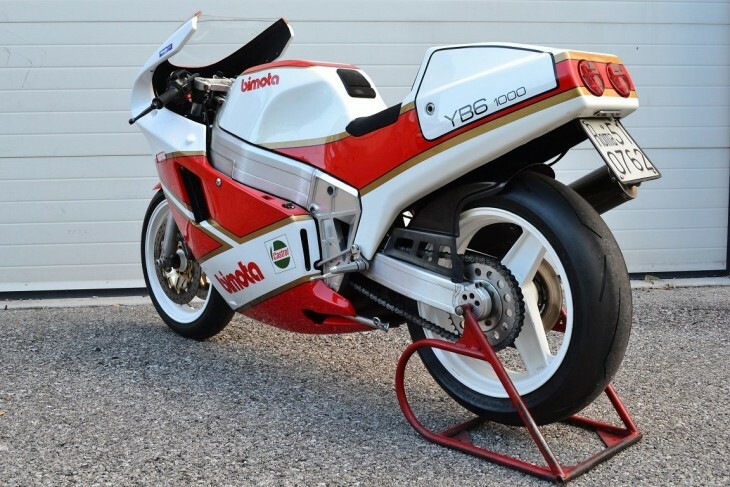 As for the race bike, thats a bit tougher to guess a price on. 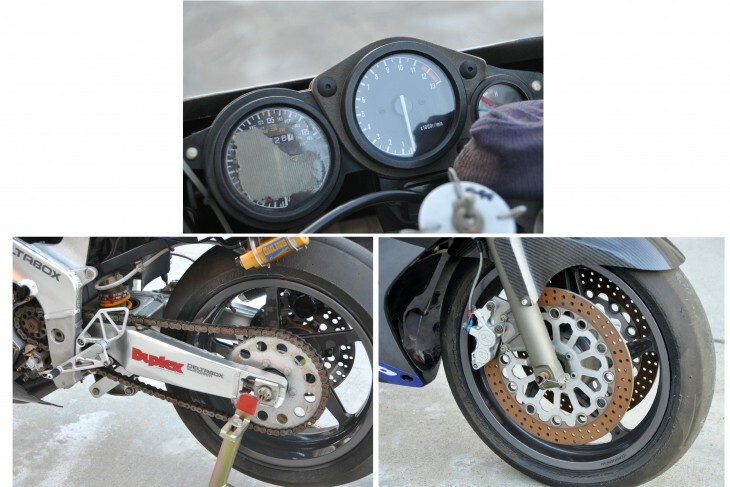 The claimed low mileage and care of ownership evidenced by bike #1 are pluses but rust, tire condition and generally being a bike for trashing on the track go against it. I think this one will go a bit less than bike #1, maybe $3,500-$4,000 USD. 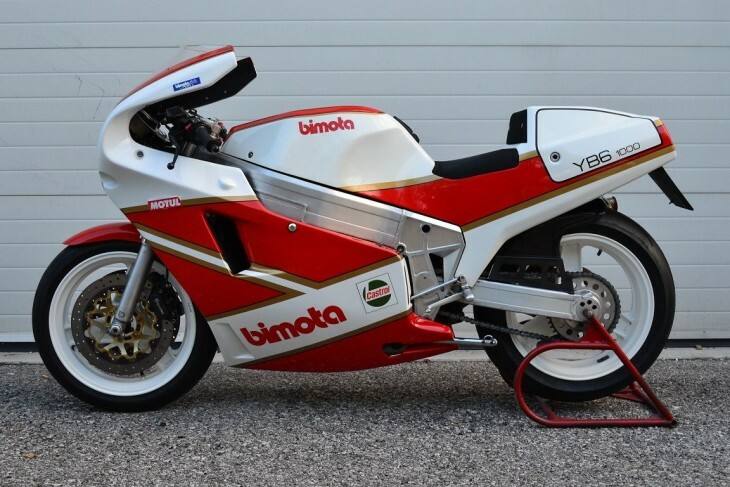 The liter-bike big brother of the successful 750cc YB4, the Bimota YB6 was a super-high performance hand-crafted machine. 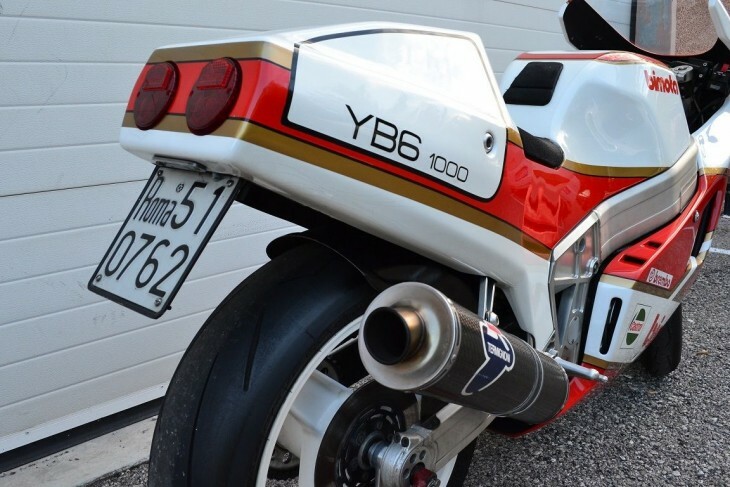 Designed by Frederico Martini, a total of 546 of the Yamaha-powered superbike were produced from 1988-90. It looked a great deal like the 1987 championship-winning YB4, but had 140 hp of Yamaha 5-valve engine behind the fairing. Squeezing the four cylinder engine as a stressed member, the massive aluminum extrusions of the YB6 provide a stable platform for the 165 mph machine. 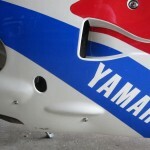 The swingarm is a similar welded extrusion, and the big Yamaha motor is rotated a few degrees back to shorten the wheelbase. 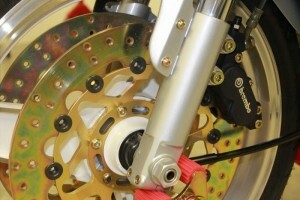 Marzocchi provided the fully adjustable 42mm forks and remote reservoir monoshock. four-piston Brembo calipers grip the 320mm front rotors, with 230mm rear. Lovely endurance monoposto fairing is one of the most together designs ever, with dual fresh air intakes and classic but exciting graphics. 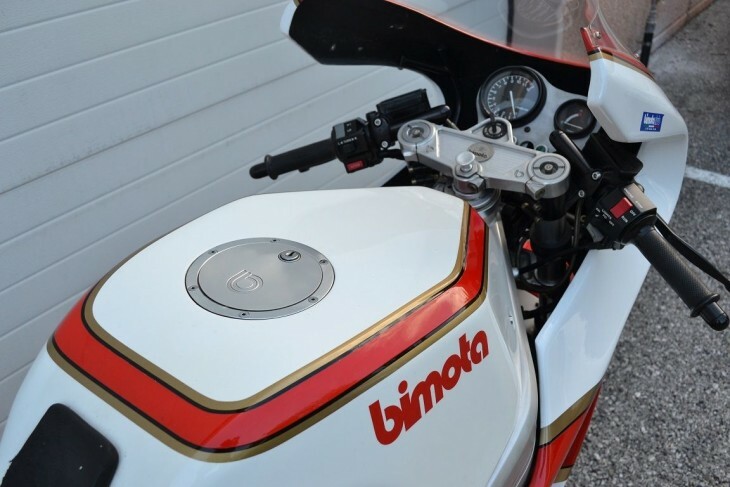 THIS IS THE BIKE DISPLAYED ON THE BIMOTA BOOK "25 YEARS OF EXCELLENCE" by GIORGIO SARTI. 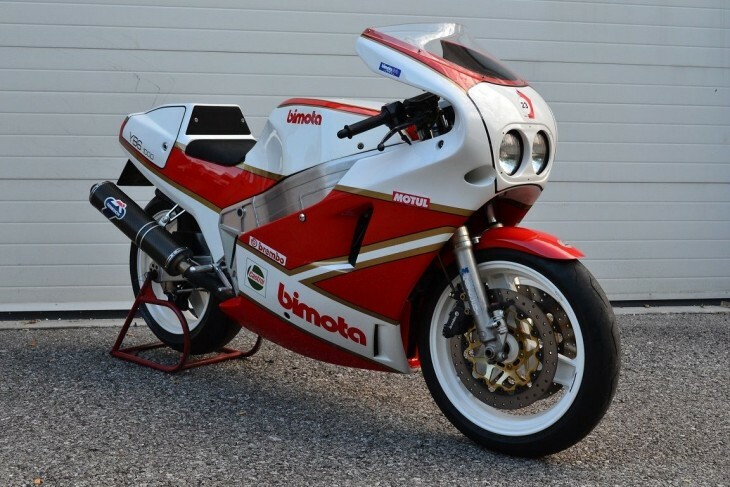 Very early model, one owner from new (the president of Bimota Club Italia), fully preserved conditions, comes with original indicators, user manual, dashboard, paddock stand. Italian registration documents. Bike is currently located in Italy, 33080 Roveredo in Piano (Pordenone) but I can get them delivered all around the World at cost, no problem. We can supply US contact as reference. 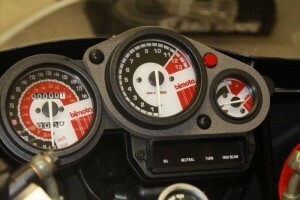 Rare as a Bimota liter bike might be, finding one which has never been run is a hundred-fold more unusual. 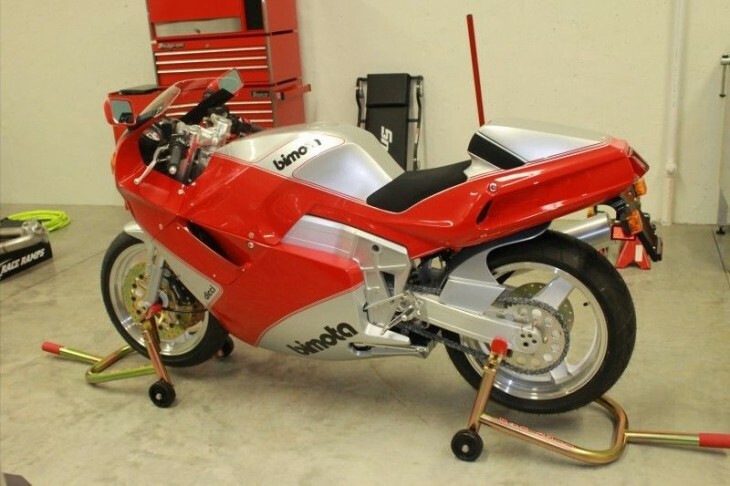 A 150hp cycle weighing 400lbs would be newsworthy today, but this one has been hidden away since 1991. Made from 1991 to 1994 but in very low numbers, the Yamaha-Bimota 1000 removes some of the compromise from the FZR 1000R "bike of the decade". 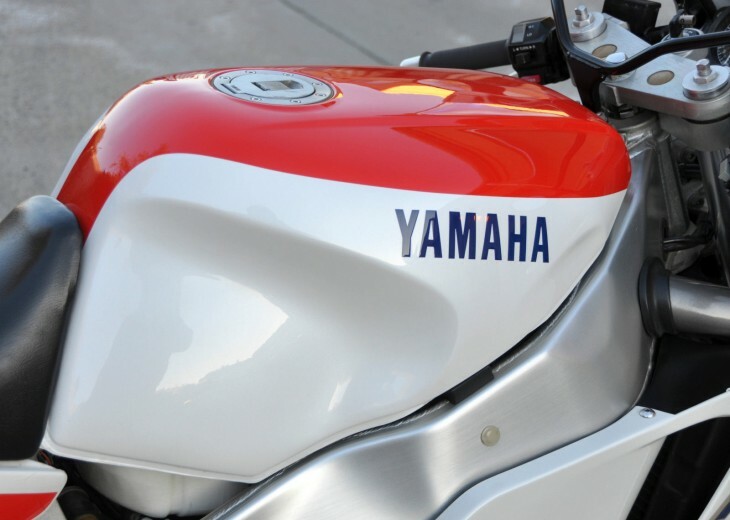 Relieved of the biposto seat, the YB10's aluminum beam frame and beautiful bodywork does conceal 20 valves and Yamaha's servo-controlled exhaust valve system which widens the torque curve. 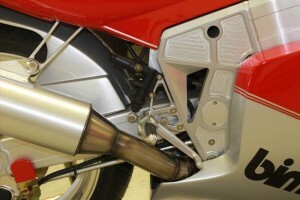 South of the twin 38mm Mikunis, the liquid-cooled liter escapes via 4-into-1 exhaust. 5-speed transmission to get you going, dual 320mm front disks and 280mm rear bring things back into focus. Billet frame connections, triple-tree, and brackets are a joy. Upside-down Marzocchi front forks are complemented by an Ohlins rear shock, all three-way adjustable. Usually this is where I discuss the bike's condition, which will be one word in this case - NEW. Evidently in a dealer's stockroom for almost two decades, the bike was purchased in 2010, and uncrated in 2013. 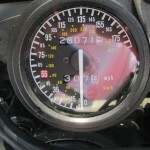 This motorcycle was purchased new in the crate from the dealer in 2010. 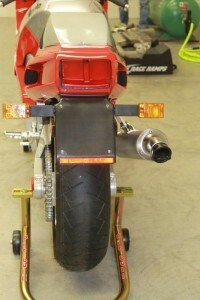 In 2013 the motorcycle was removed from the crate and the front wheel and fender were installed. 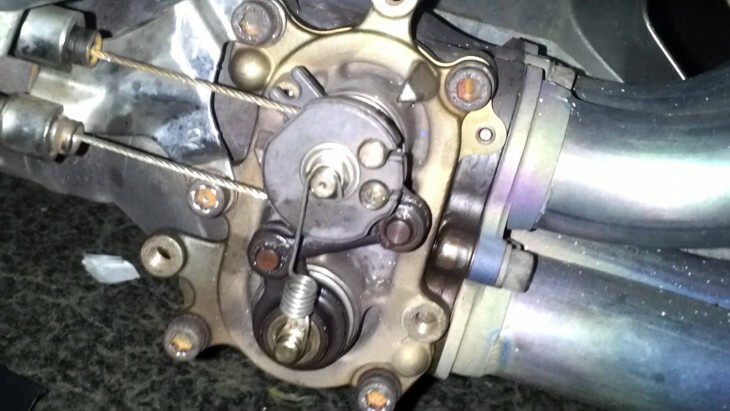 No fluids have been added to include engine oil, coolant, brake fluid, and gasoline. Except for the front wheel/fender the motorcycle is as it was when it left the factory. Since being removed from the crate it has been stored on stands in a dry, climate controlled garage and has never seen sunlight. All the original documentation, manuals, tool kit, and keys in the crate come with the motorcycle. 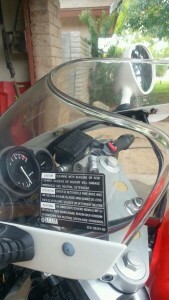 Motorcycle comes with clear title and is sold "as is" with no warranties expressed or implied. Local pickup is best since the motorcycle has no fluids there are no brakes. Finished in arrest-me red and silver, the YB10 appears ready for action, though one might expect some freshening unless keeping it as a display machine. 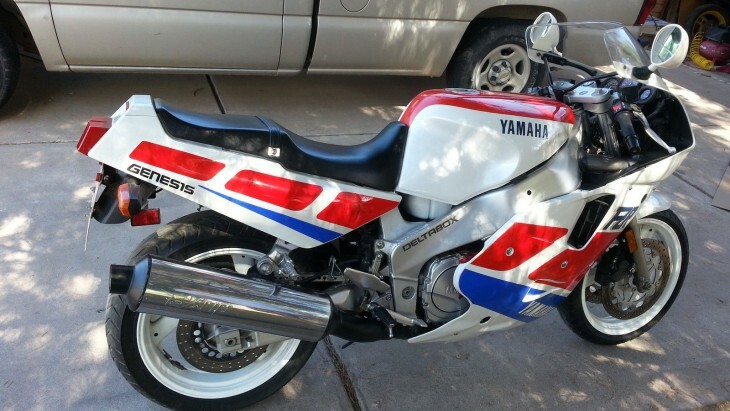 Primarily Yamaha hard parts should ease the pain of breaking in a brand-new 24 year-old motorcycle. 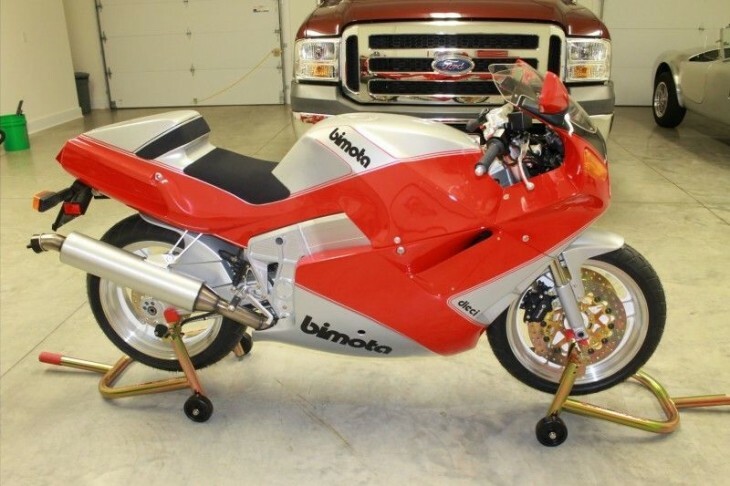 Bimota asked $24K when this bike was new, after doing your homework you may want to bid similarly on this beauty. Originally showcasing the 5-valve head in 1987, the FZR 1000 enjoyed continued development in 1989 with the EXUP ( EXhaust Ultimate Power valve ) which tailored the header opening to RPM with an ECU-controlled valve. Allowing a large header to flow high engine speeds, and providing linear low and mid-range power and torque, the system also quiets the exhaust at lower RPMs. The result is smooth delivery of nearly 140 horsepower from any engine speed. 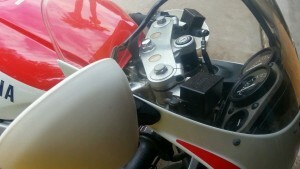 Similar setups were eventually used by Honda, Suzuki, and Triumph. 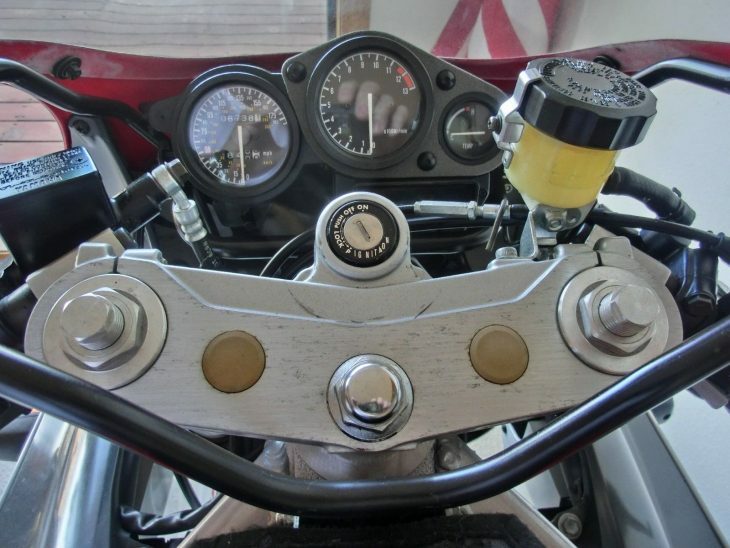 With the 1002cc engine canted forward 35 degrees in the full DeltaBox cradle, the four 37mm Mikuni carburetors are semi-downdrafts, with air intake tubes from the front. Front and rear suspension have adjustable pre-load, carried by 17 inch front and 18 inch rear wheels. 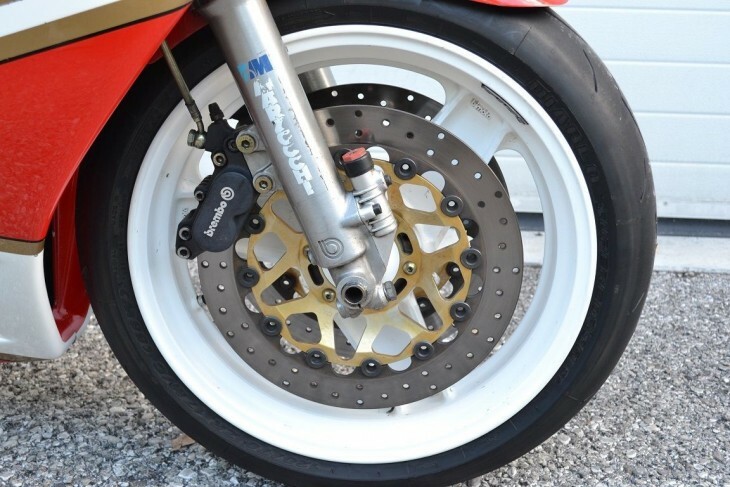 Braking is handled by dual front disks with 4-piston calipers and single rear. 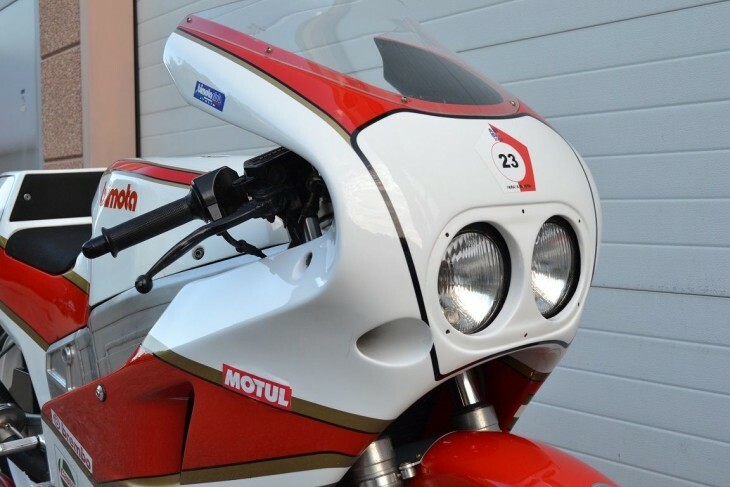 Developed from their endurance racers, the 1990 fairing carries dual headlights. 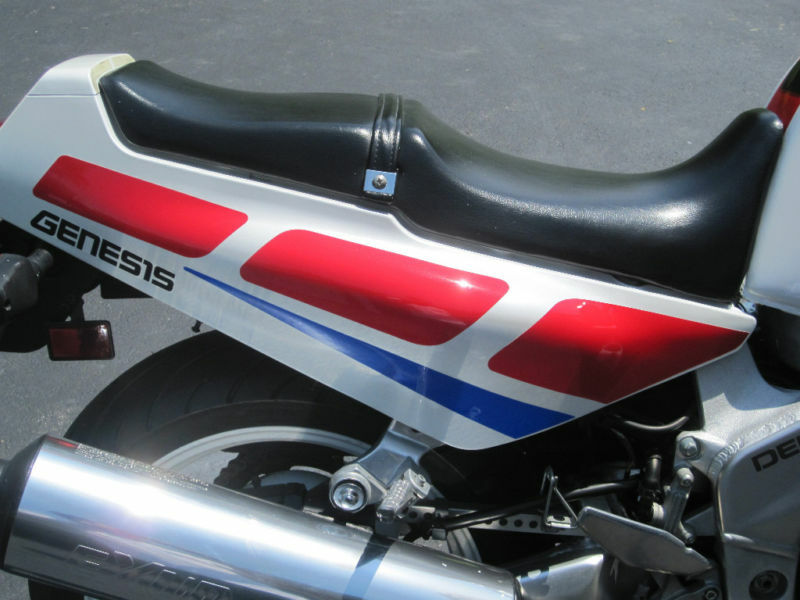 A survivor from the 80's where it was BIKE OF THE DECADE! Beautiful bike that will continue to raise in VALUE! Original tool kit included! Blinkers are installed(not in pictures). 10,167 miles with the last 5000 documented by previous owner. Bike is for sale locally and seller reserves the right to end auction at any time. A past heavyweight champ, the FZR1000 will still deliver an 11-second 1/4 mile and almost 160 mph. Cycle World named it the "Superbike of the year" in 1989, one of their ten best bikes of the year, and eventually declared the 1989 model "the bike of the decade". 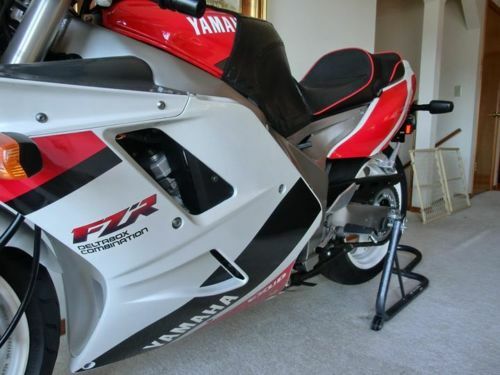 Well, it seems the big brother in the FZR lineup has shown up for auction. 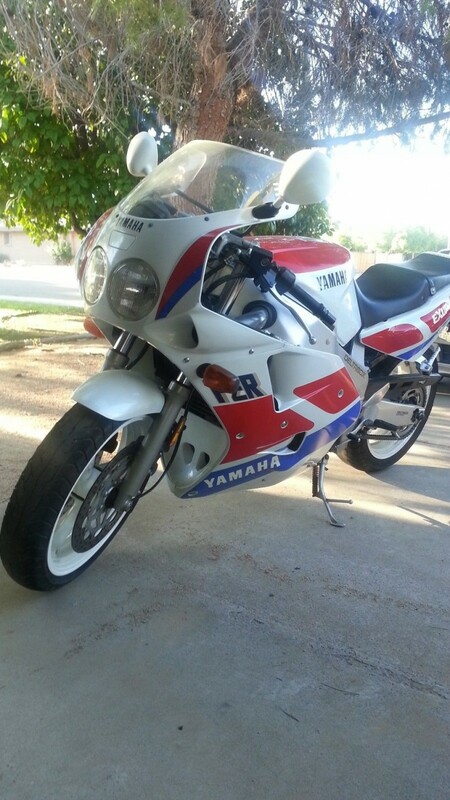 Here's the '89 Yamaha FZR 1000. 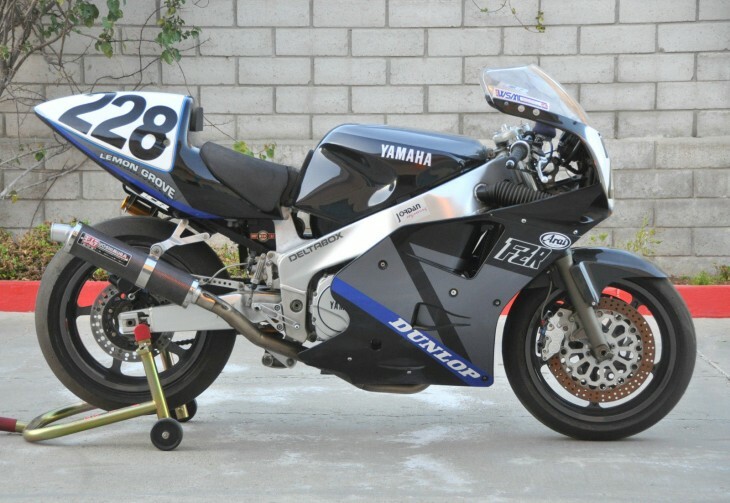 Looks a lot like the FZR 600 (Deltabox frame, great paint/graphics) posted just days ago on RSBFS, but when you twist the throttle (five-valve-per-cylinder triple digit horsepower), I suspect the similarities end there. So you get all the good looks and more power. Not a bad deal. 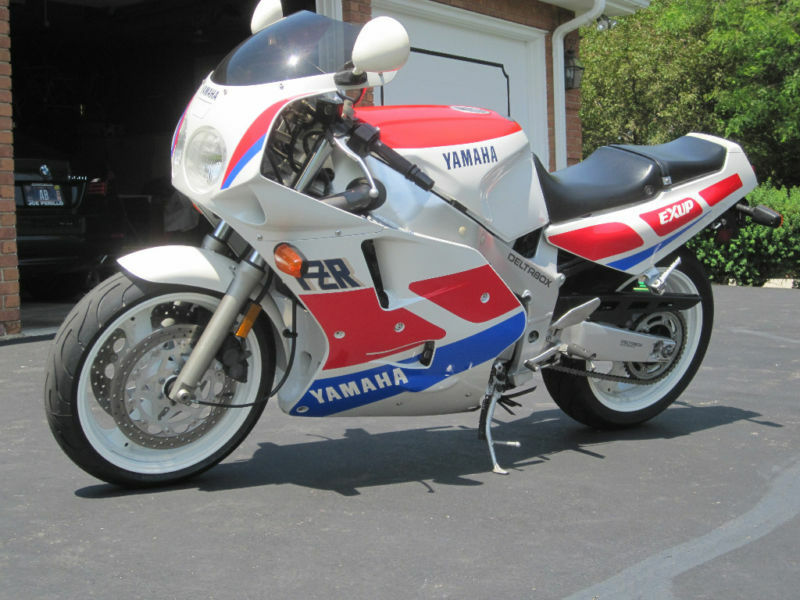 This FZR 1000 is absolutely perfect for an 1989. It has never been raced or downed. 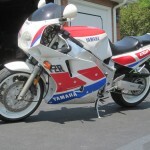 I bought this bike for my collection from a collector who sold it to me, he put less than 100 miles on it. The bike won bike on the Decade in 1989. The plastic is in excellent condition and the tires are new. I just had the bike fully serviced for 725.00. I owned a one new in 1989 and was sorry I sold it. So I searched for over 2 years until I found this bike out of upstate New York. 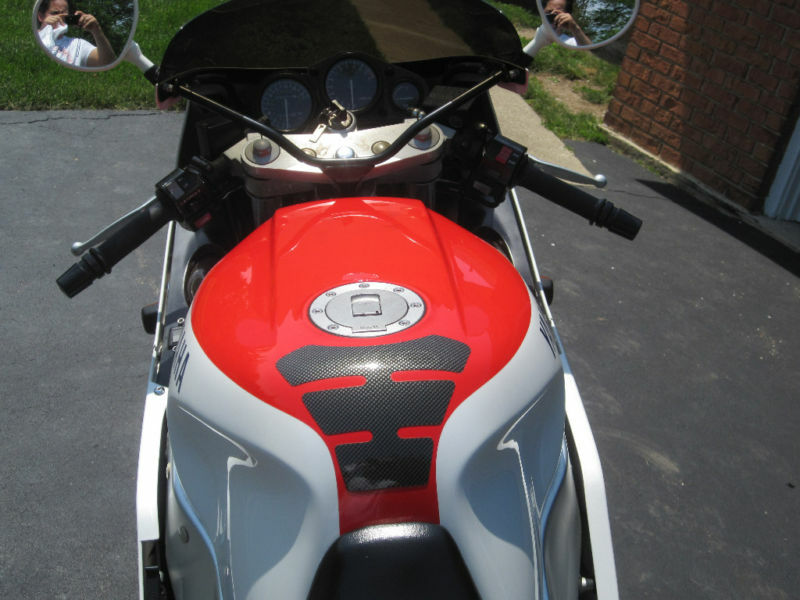 The bike is completely stock except for the tinted shield and a upgraded airbox. It drives as nice as my first one did when I bought it new. 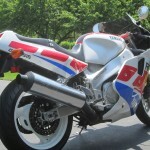 It is a very rare, usually the older sport bikes are destroyed by now. This bike will do nothing but increase in value as the years go on. It has never been downed or dropped. The bike has always been adult ridden and not raced. 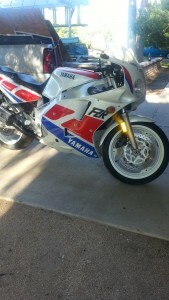 I am selling it, because I have decided to buy something else and dont have the room for all these bikes. The miles are original and I have every service record along with the original purchase contract. I only have 1 key and I am missing the owners manuel, but have a service text book that goes with it. I reserve the right to end the auction early, because I have it for sale locally. 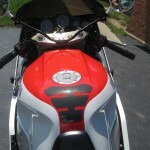 I will only take a cashiers check or cash and the bike is available to view if you are in the Northwest Suburbs of Chicago. Please no low ball offers Im not selling this bike because I have to. The last one to sell on ebay had 6000 more miles and was completely modified and it had been dropped. It sold for 5,375.00. I will meet the shippers at my house to load the bike if thats what you prefer. 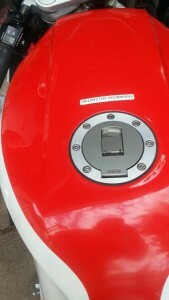 The bike will not be released without the funds clearing. I have a clear title in hand. If you have any questions please email of call before you bid. This appears to be a very clean, well maintained example for a bike this age with minimal modification. The BIN price does seem a little high compared to some previous listings so you will have to decide how much this particular bike speaks to you. The seller says it's for sale locally, so quick action may be required. If you feel the need for '89 speed, check this auction out!